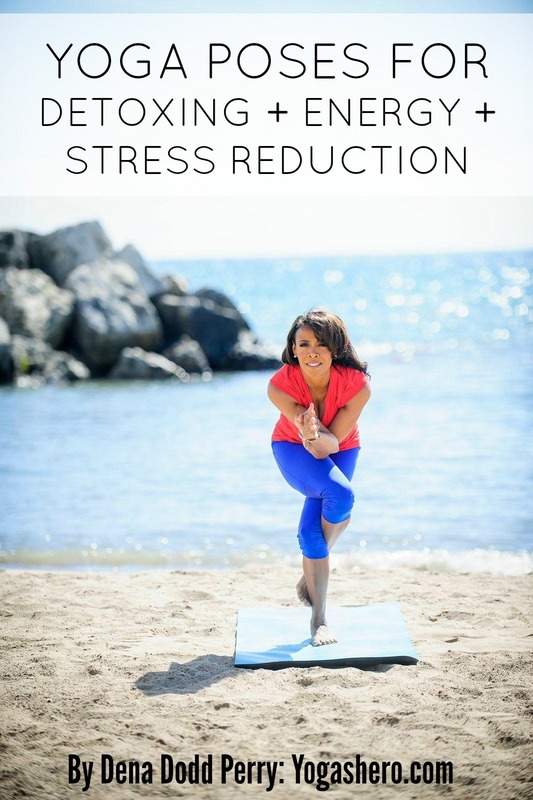 If you love yoga, then you’ll love these yoga poses for detoxing, energy and stress reduction. 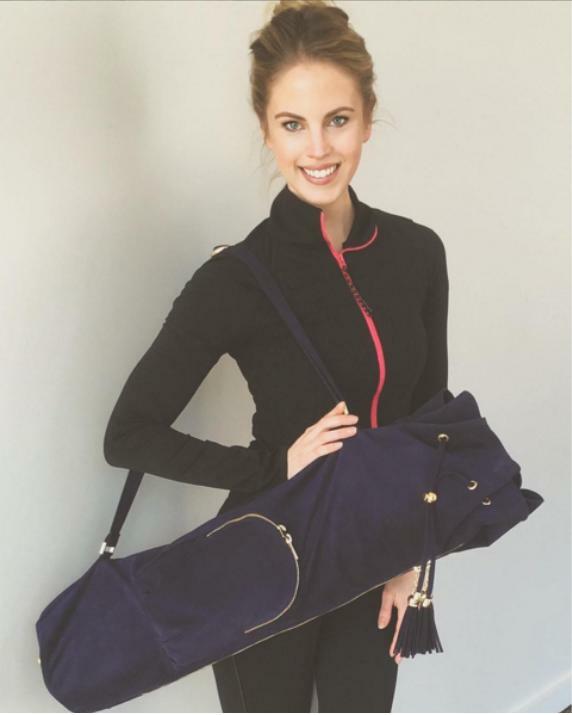 A few weeks ago I met a spirited and enlightened gal who is a yoga teacher, founder of Yogashero.com, and designer of a luxury yoga carryall bag, Dena Dodd Perry. Dena is a total Balanced Babe in the sense that she embraces a holistic lifestyle, is a determined entrepreneur (with a lot of amazing ideas and drive), a proud mom, wife and Christian, and encompasses a yoga-centric lifestyle that I absolutely love. I also got to wear Dena’s carryall bag for a project she is working on and I absolutely loved the feeling of the vegan suede and all the different compartments in there for organization. It’s really the perfect type of bag for someone that practices yoga daily in between meetings or during their lunch break. Being a spine surgery survivor, Dena focuses her practice and yoga teachings on back care. How she uses yoga to ease back pain amazes me, and she is a genuine bright light to be around. Since I’m a recent yoga devotee, I wanted to pick the brain of Dena on various benefits of yoga. Read on to see what types of yoga moves to do to stimulate detoxification, energize, and de-stress. Dena also shares her ideal morning routine and her go-to nutrient dense recipe. BB: How can we incorporate yoga into our lives to assist us with our natural detoxification process? Your body is designed to engage in detoxification every day. One way is to assist the body with a detox yoga practice. The key components of the body play a critical role in the elimination of wastes – circulatory, digestive and lymph. The circulatory system pumps blood throughout the body, delivering oxygen to and carrying waste away from cells. The digestive systems process the food we eat and separating nutrients from waste and eliminating anything the body does not need. The lymphatic system collects intracellular fluid from throughout the body and transport it to the lymph nodes where anything harmful can be removed. Yoga was developed to intrinsically stretch, compress, push and pull every part of the body. It is particularly well-suited to keep the waste-removal departments of the body functioning well. Breath is very important part of yoga. We lead bad habits in breathing that impedes the lungs from inflating fully. Low stress can lead to a tightened diaphragm, which then prevents a full functioning exhalation process. In summary, our bodies do not take as much oxygen when we inhale, and we end up not fully exhaling as much hazardous carbon dioxide as we should. These yoga poses encourage circulation of the blood via happy oxygen and lymph, OR squeezes the abdominal organs and stimulates digestion and elimination. 1) Seated Spinal Twist – SQUEEZES ABS to stimulate digestion and elimination. How to do it? Sit down with knees pointed to the ceiling or sky. Swing left bent knee down adjacent to the floor with knee facing forward. Keep right knee bent with right foot just outside of the bent left knee. Inhale; extend both arms overhead. Lower right hand behind your right sit bone. Place your left bent elbow outside the right bent knee. Root down on both sit bones. Rotate the mid-torso to right. Pull navel to back. Take your gaze towards the back wall over the right shoulder. Draw the crown of the head towards the ceiling. Hold for 5 breaths. Ardha Matseydrasana. 2) Wide Legged Forward Fold – ENCOURAGES BLOOD FROM MIDSECTION to HEAD. Heart is above the head in Prasaritta Padottasana. Spread feet far apart along the mat. Point toes slightly inward and heels outward. Inhale the torso upward halfway lift. Exhale forward fold with the crown of the head facing the mat on the floor. This abduction forward bend is probably the safest, most accessible inversion in all of the yoga practice. Hold for 5 breaths. 3) Inverted Lake or Legs up the Wall – ENCOURAGES BLOOD and lymph to travel upwards from the the feet and legs. Bathes the abdomen in fresh blood to stimulate the digestive organs. Soothes the nervous system, allowing your body to shift its attention from warding off stress to daily bodily functions. Place a bolster or rolled blanket mat width distance along the wall. Place your bottom or sacrum onto the blanket so hips are slightly higher than the heart space. Extend the legs up the wall. Inhale Point and Exhale flex the feett. Stay and hold position for 5-10 cycles. Inhale through out the nose and exhale through the mouth. Viparti Karani. 4) Head to Knee Pose. – SQUEEZES ABS. Extend both legs forward flat on the mat. Bend left knee and place left foot onto right thigh. Inhale extend both arms overhead towards the sky. Exhale forward fold using a strap around the arch of the foot or grab the right foot with your fingers. Hold for 5 inhalation/exhaltion cylces. Janu Sirsana. 5) Locust Pose – SQUEEZES ABS onto the MAT and EASY HEART OPENER. Lay flat onto the mat with belly facing downward. Take an inhale. Lift head, arms and legs off the mat giving extension of the entire back and firing up the glutes. Belly remains grounded. Note: Prefer to prep with lying on belly taking one hand and grabbing same side foot. Pull foot towards the sit bones. Alternate sides to stretch the quads first. BB: What poses help give us energy? Yoga poses that energize the body typically involve some form of back extension or lifting the chest forward. 2) Upward Facing Dog. Urdhva Mudhka Svanasana. Easier yoga variations of this pose are Cobra and Sphinx poses. 3) Bridge Pose- Setu Bandha Sarvangasana. 4) Half Lord of Fishes. Ardha Matseydrasana. Same as Number 1 listed above. Seated Spinal Twist. 5) Full Wheel. Urdhva Dhanurasana. Back bend. Advanced yoga pose. BB: What yoga poses can we do for stress reduction? My 3 S: Smile because it increases the endorphin levels in our bodies. Stretch arms and shoulders where you might hold the most tension. Or try a Seated Easy Pose: extend arms overhead to the sky. Pull opposite wrist laterally. Switch wrists. Supported Childs Pose – Place bolster between legs in child’s pose. Gently stretches lower back, relieves shoulder tension and quiets the mind. Kapha pose…grounding. Breath with Meditation on a Mantra like Heart Chakra – Peace, Harmony, Laughter and Love from Chopra Foundation. Seduction of Spirit. BB: What is your go-to favorite healthy drink? Hands down the Green Joy Smoothie from ISAAC’s in Highwood. It includes Aloe Vera, flaxseed, granola, honey, cucumber, pineapple, celery, cactus, spinach, kale, ice, and orange juice. I like that they include cactus in there as cactus is said to be great for pancreas. At home I used Breville juicer for my green juices. My favorite blends are typically kale, spinach, apple, carrot. BB: What is your ideal morning routine for energy? Upon waking I feed my dog then wash my hands and face. I love the ritual of oil pulling. I do this orally with coconut oil. I then indulge in my morning cup of organic green tea: I swirl in a teaspoon of honey. I then make an elixer of apple cider vinegar (2 teaspoons) and fresh lemon juice (1 teaspoon). It’s then time to make breakfast for my family, carpool my kids to school, then I make time for movement. I walk on the treadmill for 30 minutes and then do my at home yoga routine for another 30 minutes. 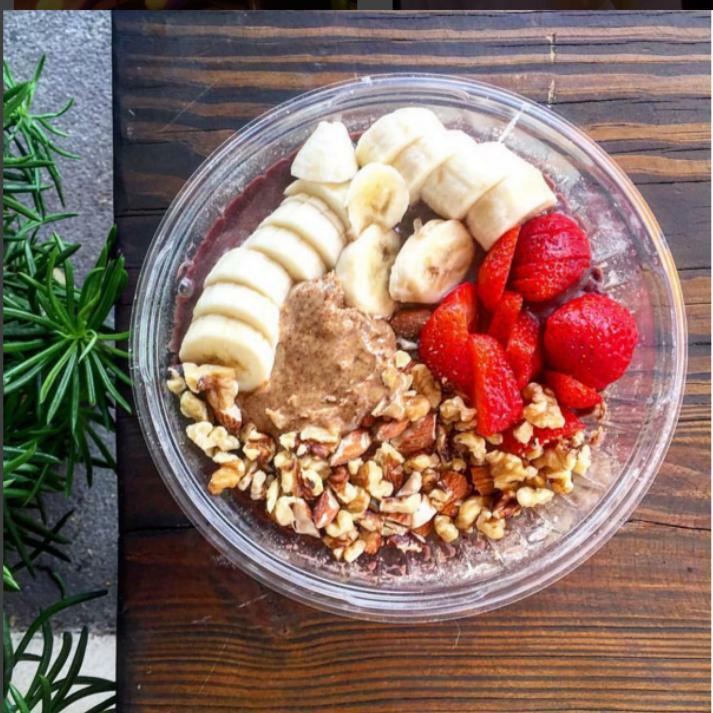 BB: What nutrient dense recipes are you currently loving? My favorite soup: Carrot soup with vegetable or chicken broth, coconut cream, ginger and turmeric. First you boil the carrots. Then use a VitaMixer to crush the carrots. After this, you combine the rest of the ingredients in a large pot and bring to a boil. Let simmer for about 20 minutes and enjoy! Love this! Such a great read and tips. I think my blog will resinate with you! Thanks Giovanna!! So glad that you like the content!